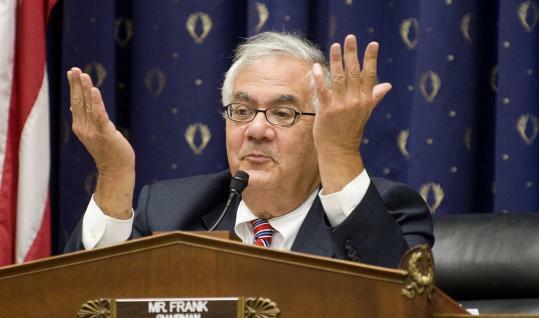 WASHINGTON — When US Representative Barney Frank spoke in a packed hearing room on Capitol Hill seven years ago, he did not imagine that his words would eventually haunt a reelection bid. Now, it’s clear he was wrong on both points — and that his words have become a political liability as he fights a determined challenger to win a 16th term representing the Fourth Congressional District. Fannie and Freddie collapsed in 2008, forcing the federal government to buy $150 billion worth of stock in the enterprises and $1.36 trillion worth of mortgage-backed securities. “I was late in seeing it, no question,’’ Frank said about the lenders’ descent into insolvency. Republican Sean Bielat, who is trying to unseat Frank, has been hammering away at him with a website titled “Retire Barney’’ that features clips of Frank at the 2003 hearing and elsewhere. During debates this week, he called Frank “one of the leaders of the economic disaster’’ because he supported Fannie and Freddie when they were taking the risks that led to their collapse. But Frank said that putting blame entirely on him is unfair — and several independent analysts agree. They said Republicans also failed to take warning signs seriously enough to avert disaster, despite controlling the White House and both houses of Congress between 2003 and 2007, a crucial period leading up to the Fannie and Freddie failures. Another analyst, University of Maryland economics professor Peter Morici, put it more succinctly. “This is a bipartisan mess,’’ he said. That mess has a long history. The government created Fannie Mae in 1938 to make mortgages more affordable, and its cousin Freddie Mac came along in 1970. Congress allowed them to operate as private companies. At the same time, Fannie and Freddie were spending $155 million on a massive lobbying operation seeking to thwart any crackdown on their operations. They poured $4.2 million into congressional campaign coffers in the years before they collapsed, according to the Center for Responsive Politics. Their executives, lobbyists, and political action committees donated to both Republicans and Democrats, including Frank, who received about $65,000 between 2000 and 2008, a Globe review of individual contributions found. Falcon sent his report to Frank and other Financial Services Committee members and asked that Fannie and Freddie be required to disclose more about their finances and be subject to tougher oversight. He followed it up with another report in June 2003. A few months later, the Bush administration said it would try to rein in the enterprises by creating a regulatory authority within the Treasury to oversee them. The warning signs were compounded by revelations in 2003 and early 2004 that Freddie Mac and Fannie Mae had misstated earnings by billions of dollars in an effort to meet growth targets. Frank, who became ranking minority member of the Financial Services Committee in January 2003, says now he doesn’t remember Falcon’s reports. “I had just taken over as ranking member, all this stuff was very new to me,’’ he said. Frank tried to tackle Fannie’s and Freddie’s problems from another angle, he said, introducing a predatory lending bill in spring 2004 that would reduce subprime loans. But the legislation did not address the voracious quest for profits or other problems at the mortgage lenders. When the legislation went to the Senate, Republican support was splintered, and the White House withdrew its backing, saying the bill was not strong enough. Top Bush strategist Karl Rove still blames Frank for its failure, saying Frank and other Democrats portrayed a vote to regulate Fannie and Freddie as “anti-black, anti-brown, anti-poor, anti-homeowner’’ because of the enterprises’ affordable housing mission. Frank dismissed those assertions, saying the splintering of GOP support was not his fault. “They couldn’t get their act together,’’ he said. When the Democrats won control of the House in 2006 and Frank became chairman of the Financial Services Committee the following year, one of the first measures he helped pass imposed tougher regulations on Fannie and Freddie and prevented them from taking on too much risk. By the time Frank’s bill passed, it was too late. Fannie’s and Freddie’s debt had reached perilous levels but they had only a small amount of capital on hand — roughly equal to one-40th of their debt, according to the Stern School of Business at New York University. When home prices leveled off and homeowners defaulted on mortgages, Fannie and Freddie could not absorb the losses. Unlike 2003 — when, Frank said, he didn’t realize what was going on — this time, he was deliberately trying to reassure the public, he said. Less than two months later, the government seized Fannie and Freddie and the bailout began. They were among many culprits in the financial crisis, including investment bankers, mortgage brokers, and ratings agencies. “The financial crisis was caused by deteriorating underwriting standards, almost all of which was done by privately securitized mortgages on Wall Street,’’ said William Wheaton, an economics professor at the Massachusetts Institute of Technology. Frank recently played a key role in the passage this summer of extensive regulation of Wall Street. Still, it is Fannie and Freddie that haunt him on the campaign trail. Koppell, at the University of Arizona, said it was an unusual marriage of interests that propelled the mortgage lenders into collapse: housing advocates who wanted more affordable loans, business interests that profited from greater volume, and politicians on both sides of the aisle who wanted to please the advocates and the businesses. Donovan Slack can be reached at dslack@globe.com. Follow her on Twitter @DonovanSlack.